It is imperative that the Rohingya issue be addressed as soon as possible. The plight faced by these persecuted people has been thrust into the headlines of international news recently, following cases of thousands of boat people stranded at sea as well as reports of slave labour camps and mass graves. These Rohingya immigrants who sought to escape persecution from a country that has long eroded their cultural identity and civil rights, entrusted themselves to opportunistic and deceitful human traffickers who see their plight not as a humanitarian issue, but as nothing more than a lucrative opportunity. This has resulted in extreme cases where people were allegedly thrown overboard, or whole ships left abandoned, its passengers left to fend for themselves against the harsh elements of the sea, many suffering and succumbing to malnutrition. At least 30 graves mass graves have been discovered at the identified slave camps near the south of Thailand in the Songkla province. Survivors of such camps report of the deplorable conditions they have been forced to live in as well as the alleged use of coercion and violence to extort more money from the Rohingya families. As Malaysia shares the borders close to where this incident has happened, it is feared that such camps may exist within Malaysia’s boundaries and perhaps Malaysia has unknowingly facilitated the trafficking and abuse of the Rohingya people. However while the responses have been mainly aimed towards the human traffickers, with military action being considered, there is a far greater crime being played out that demands justice for these people who have to suffer so much unnecessary hardships. The Myanmar government is equally, if not wholly responsible, for the sorry state of affairs the Rohingyas find themselves in. As noted by the report published by the Equal Rights Trust, the Rohingyas trace their ancestral roots in the Rakhine region several centuries back, long before the creation of modern day Myanmar. The term is derived from the word Rohang which is the name of the Rakhine state. This claim to historical ancestry is rejected on many levels in Myanmar. The Myanmar government claims that the Rohingyas are in fact migrants from Bangladesh and have no rights to indigenous identity in Myanmar. The term “ Rohingya” is not recognized by the government and the Rohingya people — in spite of their protest and rejection — are referred to as Bengali. 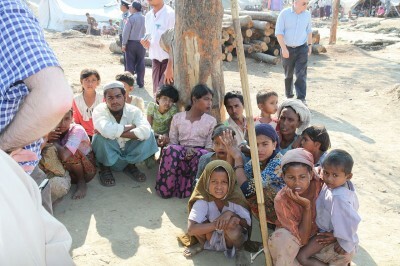 The result of this unwillingness to recognize that the Rohingyas are part of the Myanmar demographic landscape, coupled with their contentious religious relationship with the majority Buddhist populace which denies much of the historical Muslim influences upon Rakhine state, have led to the purposeful and systematic deprivation of the civil rights of the Rohingya community. The Rohingyas are prevented from using the term in official documentation including identity cards, passports and were even disqualified from the country’s census of March 2014 unless they agreed to the term Bengali. The consequence of this can be seen now as many Rohingyas, who possess no legal documentation, have become stateless and have been forced to flee Myanmar in order to escape persecution in a country that has become — as some have described it — an open-air prison. The Rohingyas have no other alternatives than to procure the services of smugglers, who they pay a significant amount of money in order to obtain passage to another country. The problem then morphs into human trafficking. These refugees are unknowingly trading one prison for another. It is therefore not enough to address the issue of human trafficking by bringing the traffickers themselves to justice. It is necessary to make the Myanmar government accountable for this travesty, addressing the problem of ethnic persecution within the country itself and ensuring that the civil rights of the Rohingyas are restored, or, at the very least, their basic human rights respected. The only significant hindrance would be the strict adherence to the non-interference policy which ASEAN governments have maintained. Malaysia and Indonesia have turned away many of the boats opting to send these refugees back to the country that does not recognize their basic humanity. The Malaysian and Indonesian governments do not want to be inundated with illegal immigrants that they just cannot cope with. There is a distinction that needs to be made between refugees and illegal immigrants, as the current discourse labels the Rohingyas mainly as the latter, when in fact given the mentioned historical and political context, it would be more appropriate to term the Rohingyas as political refugees. With the increasing outflow of these refugees from Myanmar, the ASEAN policy of non-interference has proven to be untenable, given the humanitarian crisis which has gotten far worse over the years. The Malaysian, Indonesian and Thai governments should apply diplomatic pressure immediately upon the Myanmar government to address the root problem which is the persecution of the Rohingyas. Once the persecution stops, the massive exodus of refugees through land and sea will also come to an end.